*2015 Golden Lamp Award Winner, Beyond the Clasroom resources (given by Association of American Publishers) ; 2015 Revere Award winner, 'Relate' category. 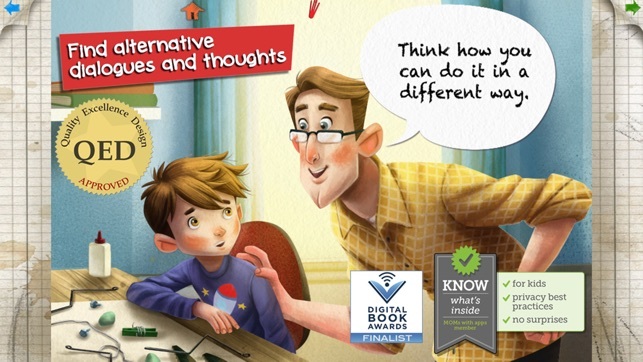 *A 2014 Parents' Choice Gold Award Winner. *App Circus Online Competition Winner. *Digital Book World Award 2014 finalist, and recipient of their Quality Excellence Design seal. *Recommended by National Science Teachers Association and praised by School Library Journal. *Teachers With Apps Certified App Badge of Approval, and chosen as one of their Best Book Apps in 2014. 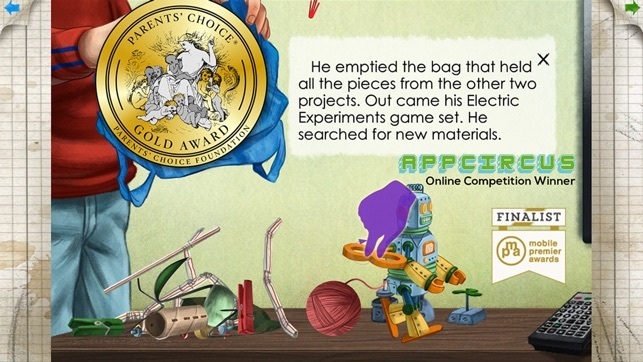 *Picked as Editor's Choice at Best Apps for Kids. Almost 5,000 downloads in its first week out. Reached #10 in the US App Store 'apps for ages 6 to 8' category, and #14 in the Books category (only 5 days after release!). Ranked top 25 in 48 countries. DISCLAIMER: This app version has not been tested for iPhone 6. 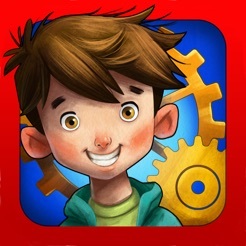 A creative tinkerer, Axel Jansen struggles to connect with his classmates and get them to see past the fidgety, distracted, clumsy boy they think he is. Inspired by the work of Kinetic artists, the third-grader decides to build a moving insect to show everyone at school what he’s capable of. * ALLOWS FOR DIFFERENT LEVELS OF READER IMMERSION: Explore pages to discover extra dialogues, thoughts, or details of Axel’s creation process. Or skip them if you’re anxious to find out what happens next, and then read the story again if you want to know more. * SOME OF YOUR INTERACTIONS ARE NEEDED TO MAKE THE STORY PROGRESS. (Hints provided). * PLAY A CREATION MINI-GAME INSIDE THE STORY: make your own animals using objects from Axel’s kitchen. * HEY, YOU’RE THERE… AT THE END OF THE STORY! *OPTIONAL SETTINGS: Turn off sound effects and/ or Narration. 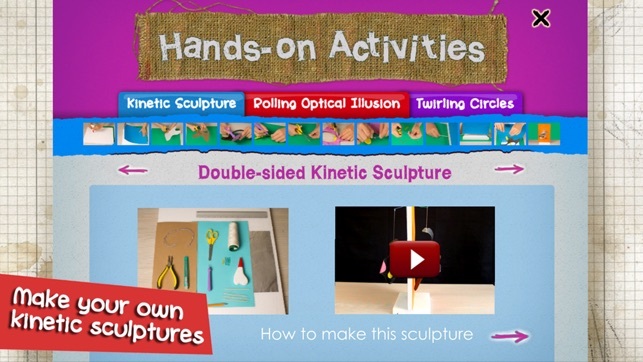 - HANDS-ON ACTIVITIES: Step-by-step instructions to make kinetic sculptures for different levels of ability. - BIOGRAPHIES of the 3 kinetic artists featured in the story. 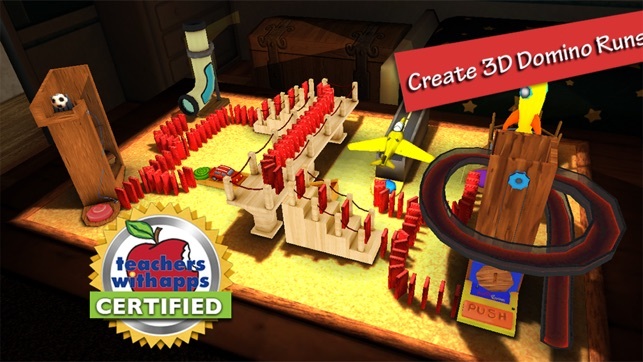 - 3D OPEN-ENDED GAME: New! Domino Effect creation game. 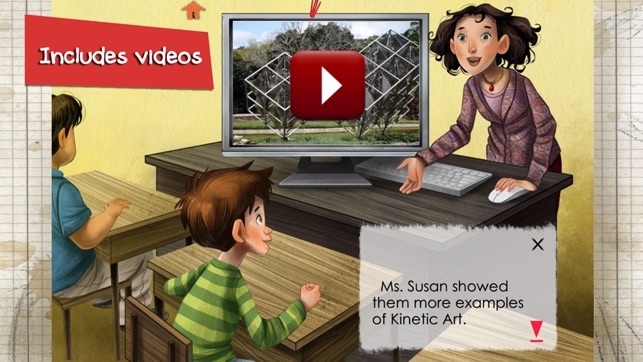 Loved by Teachers With Apps: "mesmerized every group of students we shared it with. It delightfully conveys a powerful and poignant message to the youth of today – don’t give up!(...). 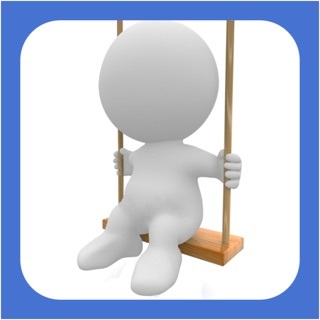 Teachers are going to love sharing this app time after time, and so will parents.(...) 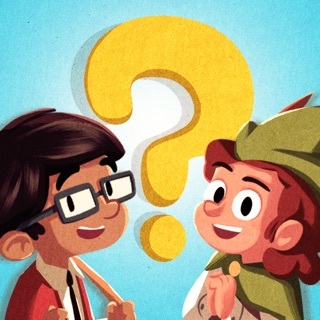 This app has more than character education going for it (...) buy this app to see and experience the magical ending. 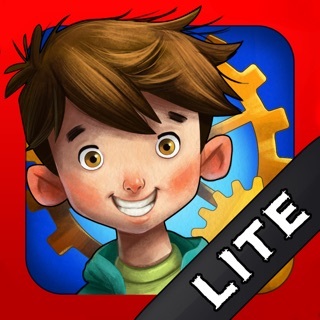 Well worth every penny"
Carisa Kluver, of Digital Storytime: ""This title is filled with polished animation and top-notch interactivity (...) nearly all of the enhancements add to or reinforce the storyline. Children will love the variety of ways to engage with this story (...) Overall, this is a terrific and unique title (...) The story has great messages about learning to make the most out of our unique talents, sticking with a project and standing up to bullying. It will even resonate with kids and families dealing with special needs. Filled with educational enhancements and a host of other extras, Axel's Chain Reaction is an engaging blend of fiction and non-fiction, with extension activities designed for inspiration." Story by: Allison Pomenta. Illustrated by Mónica Armiño. Development by: Cubic Jigsaw (a division of Higuera Studios). Very engaging and interactive. Story can either be narrated or read on your own. When you tap on the words when reading it on your own they change to a larger font. There are several hidden surprises on each page of the story. The Activities are SUPER! Instructions are VERY clear and visuals are given for step by step. Game is fun and challenging with many options and levels. I would add a simple feature to have the green "Next Page" button pulsate particularly when no narrator is reading. I was in limbo sometimes not knowing when to go to the next page. Also, a typo when the girl says "His name is just like yours." And the story is printed with "Alex" nodded, instead of "Axel".